Dunwich was an important Templar site having its own preceptory, chapel, mill and fish ponds. It was also a Templar port for life’s essentials.....like wine from Gascony! ...Simon suggests Dunwich could have been the inspiration for the ‘Red Eve’ tale from author H.Rider Haggard in 1911. ‘ The story builds on a gradual sense of menace that originates from an antique whistle found at the Templar’s church. The town suffers from coastal erosion, and has gradually been slipping into the sea for centuries. It has always had an eerie reputation, as churches disappeared into the sea, coffins stuck out from the cliffs before falling onto the rocks below. Serendipity doesn’t end there....I became involved in the Dunwich grid because my partner has a sister living near Walpole church and we went down to visit. I was immediately taken by the area, feeling that familiar pull to look into the location. Walpole turned out to feature heavily in the Dunwich grid dynamics. Recently my partner’s niece, based in Lincolnshire, decided to get hitched and is having the wedding reception at Caenby Corner which is also on the Lincolnshire TM Willoughton grid ...not far from the Lincolnshire Blyborough. Great serendipitous links......One family, interacting with two counties, miles apart, both of which have Blythburgh/Blyborough based place names, both have Black dog legends, both had KT preceptories. 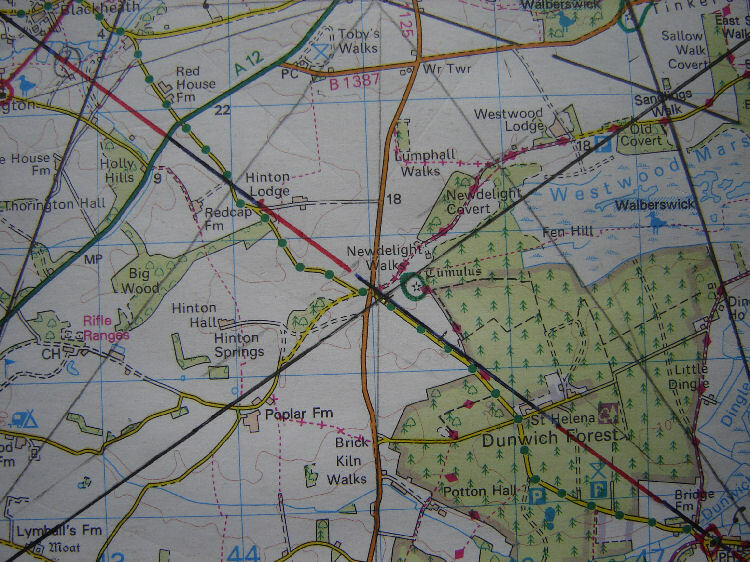 As you will see the Suffolk Blythburgh turned out to be at the centre of the Dunwich Pentacle. Having driven through Halesworth to get to Walpole I already had a taste for the area ...and knew straight away Halesworth was the center of something. Getting the OS 1:50 000 scale maps home I soon noticed the depth of involvement... Halesworth was the center of 4 circles...Showing a total of 15 churches on the circumference of the circles. What’s unique about this system is the placing of the 6 churches of Walpole, Bramfield and Wenhaston....These churches were situated in such a way that a line could be connected between them linking the 3 outer rings...But that’s not all...The 3 triangles all then connected back into the Halesworth center.....Showing 6 60 degree angles on the 3 outer rings if connected back to the Halesworth center. One of the lines acted as one side of 3 triangles. Other TM grids have shown a hex based system usually centered on the end of a penta arm point...Bruer and Glastonbury being good examples...For some reason Halesworth leans towards the hex dynamics in the 60 degree angles of the three triangles,.....but not in the traditional Star of David format...something different about the Dunwich system. 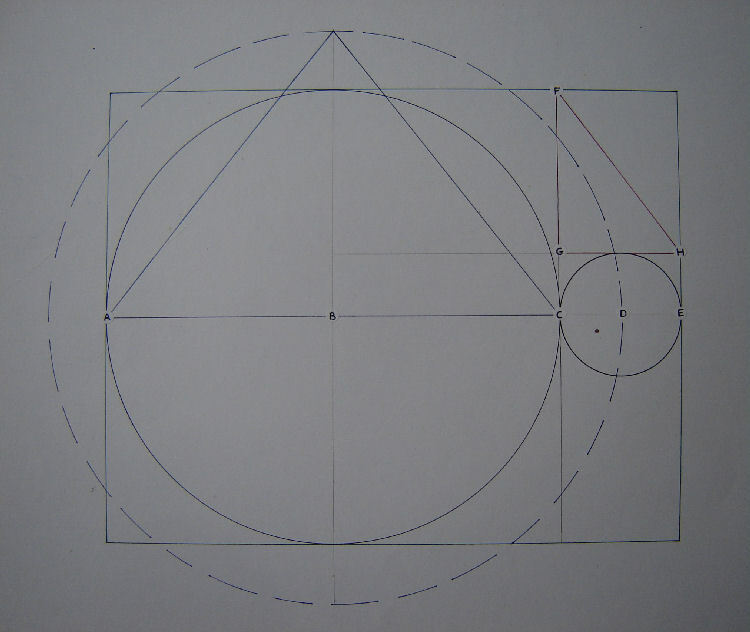 Dunwich is also the first system to show Earth / Moon proportions in the actual circle sizes depicted...The proportion of the smallest circle from the Halesworth center when compared to the red line circle enclosing the Blythburgh penta is correct to the Earth / Moon ratio. 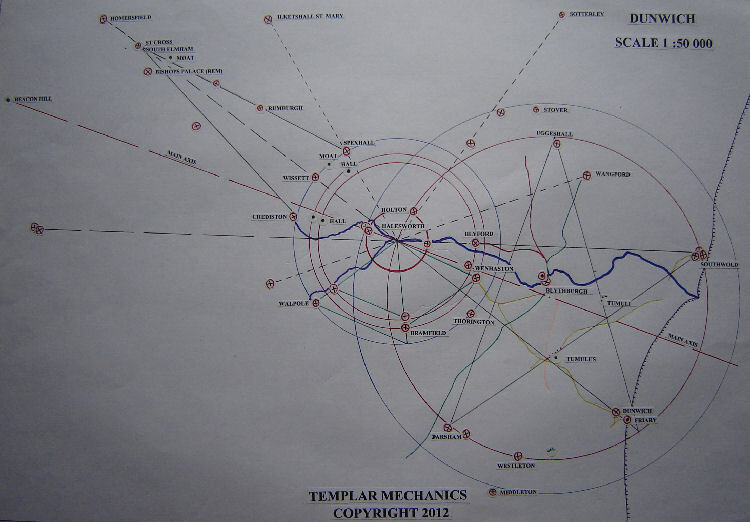 The Halesworth center is also at the meeting of two small streams/rivers that merge at the centre and continue through the Blythburgh penta and out to sea near Southwold....The merging of rivers and streams is noted at the centre of other TM grids listed on Templar Mechanics. Halesworth also has an ancient chapel....ruin/remains/site of ... shown on the OS map as ‘Chapel’ near this center.The Halesworth centre is also the west arm point of the Blythburgh pentacle. Darsham - Church and a priory farm marked on map at penta arm ..suggesting a priory was once situated in the area. Blythburgh sits at the center of the Penta .....The penta legs cross ( Golden section division) to the south at the meeting of several tracks / roads, with a local Tumulus nearby. Here just to the North lies Toby’s walks, which are linked to another local myth mentioned in the detailed links at the base of this article....well worth a read. Main Axis focuses into a Beacon Hill ...which I’m sure would have had some prominence in local folklore years past. 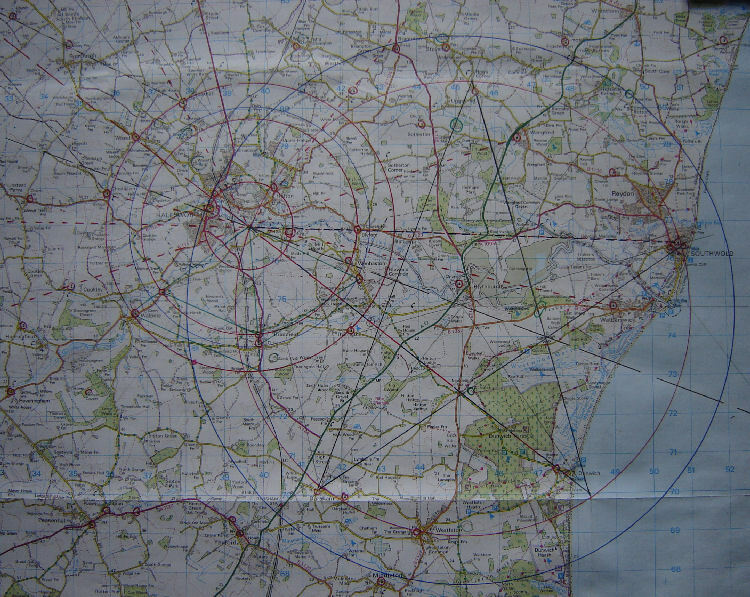 I have marked the roads flowing into Blythburgh as I believe it shows a good interaction with the evolving grid....as do the others on the TM website. Blythburgh church and the surrounding area are central to the Black dog apparition legend. Once again another Templar site has tales of apparitions...This is only due to the thinning of veils between dimensions that exists at Earth energy sites. It doesn’t mean the site is negative as such...only that easier access to other realms can be obtained through interacting with them.....like a city with good and rough areas. What you access is down to approach, intent and self discipline.. How any apparition is perceived can also be down to the many different interpretations/meanings of the same image. Once again it hints of knowledge being in the Templar order of Earth energy sites...and how important they were to own, occupy and work. I have posted a few tasters below from some links I found to the area legends and the story ....enjoy !...I’m sure there are many other treasures of folklore in the area yet to rise to the surface....Please e mail if you have any other information on the notable points of the Dunwich Grid. 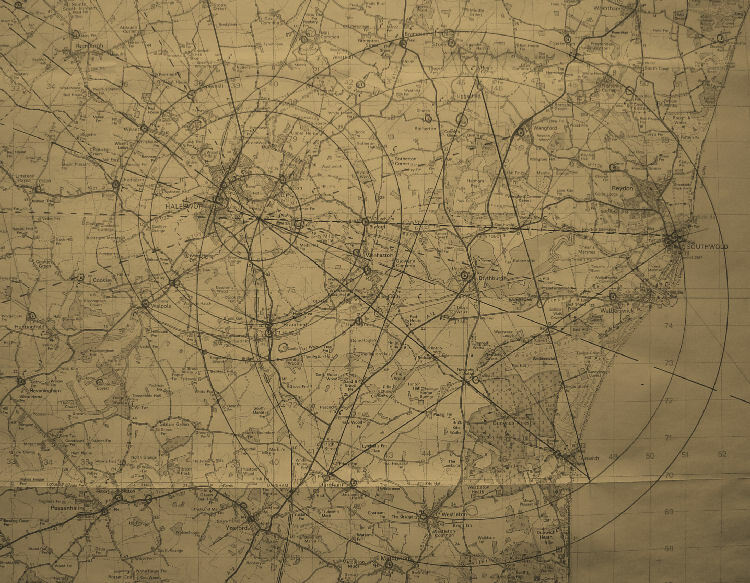 Google Earth images, the extending of major lines of the Blythburgh penta and main axis alignments, will appear in a separate article later under the Dunwich section. The tale of Black Toby is a tragic one, almost certainly of prejudice leading as so often to injustice. In 1750 a regiment of Dragoon’s was spending time in and around the lovely village of Blythburgh. After a night of drinking the body of a servant girl, Ann Blakemore, was found beside the drunken form of Tobias Gill, a black drummer. People immediately leapt to conclusions, and after a hasty excuse for a trial Tobias was found guilty of her murder. He was sentenced to be hanged in chains on the spot on the sandy common where the girl’s body was discovered. After his execution, when villagers and officials considered things more coolly, it dawned on some of them that a terrible wrong may have been done – there had been no marks found on the servant girl’s corpse: had she died of drink? or simply expired of natural causes? And the disgraced dragoon had gone to his death pleading his entire innocence of the crime. Whether because of the injustice he suffered, or because as a killer he was buried in unhallowed ground, Tobias it appears decided to haunt the spot where he died. And in some style too, said in some versions to drive a hearse pulled by headless black horses, though rather more prosaically in others he is simply encountered near the place of execution, still proclaiming his innocence. Rather incongruously that place is now a picnic site, known locally as Toby’s Walks: sandwiches, sand and spooks anyone? In appearance the phantoms vary from region to region, but it is not uncommon for them to be described as calf sized, with saucer eyes and a shaggy coat. Phantom dogs are not always black however, the one that is supposed to haunt the area around Cawthorpe and Haugham in Lincolnshire, is described as white, but still has saucer eyes and is as big as calf. The Cu Sith, the traditional fairy dog of Scotland is dark green in colour, with a shaggy tail up its back. Black dogs are more often than not associated with a specific location such as an old trackway or lane, this is sometimes reflected in the name of the routeway, although not every 'Black Dog Lane' has a tradition of the haunting. Other phantom dogs are more benevolent and stories exist of people being helped from tight spots. For example Augustus Hare in his book 'In My Solitary Life' recounts a common tale he heard about a man called Johnnie Greenwood, of Swancliffe. Johnnie had to ride through a wood in darkness for a mile to get to where he was going. At the entrance of the wood he was joined by a black dog, it pattered beside him until he emerged from the trees, whereupon it disappeared as quickly as it had arrived. In summery it seems that the phenomena of phantom dogs is a complex mix of folklore, sightings, and local superstition, which has roots reaching far into the past. There are probably a myriad of different explanations for modern sightings, and a phantom black dog is a powerful archetype, incorporated into modern stories such as the 'Hound of the Baskervilles' by Arthur Conan Doyle. We hope to delve into the mystery further in the future, including some of the many folk tales associated with them. Apparition of a creature that resembles a black dog. Black dogs are said to haunt a particular place or area like crossroads, roads ,lanes, footpaths, bridges, gateways, doorways, fields, ect. These creatures are usually seen at night but in rare cases there have reports of seeing them in the day. mostly seen in rural places. Appearance :Black in colour though have been seen in white. They are a lot bigger than a average size dog have a shaggy coat big red eyes that glow long teeth and have a slavering mouth. Few are heard to bark or growl usually silent. They disappear as mysteriously as they appear as they simply vanish into thin air some gradually fade until nothing others change into another form. The black dog is also known as shuck, skiker, Barghest, Padfoot, Hooter and in Lincolnshire is known as Hairy Jack. A black dog has been seen near the fish pond near the old yard.